It is good to see base metal prices on the rise. Copper prices have surged to a ten month high, boosted by growing optimism about economic growth and demand in China. Copper has hit $5,646 per tonne on the LME, up $125 from Friday. Aluminium prices are also up to $1,855 per tonne, a gain of more than 40% since February and the highest level since November. Nickel and zinc also hit ten month highs of $17,ooo and $1,740 per tonne respectively. Thanks again to all those who have put me in touch with Nchanga metallurgists from the early 70s. 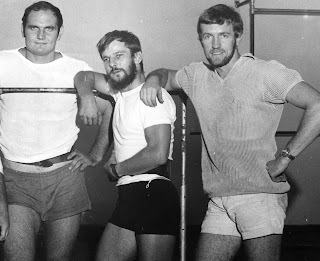 The photo on the left was taken in the Nchanga weight-lifting club in 1971. 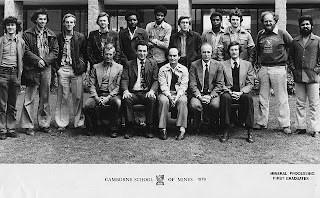 I am pictured (right) with fellow metallurgists Doug Edmunds and Vic Bryant. Doug later became the founder of the World's Strongest Man competition, and is currently (see photo right) founder and Director of IFSA Projects, the first world governing body in the strongman sport. 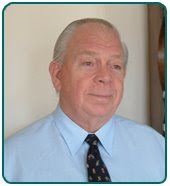 Vic Bryant is now a consultant with Micon International Ltd in Canada. Science debunks global warming again? MEI has received by email an article containing views on global warming that some will find very controversial and politically driven. I would be interested in any views on this, as the need to reduce carbon emissions impacts on every industry, particularly the minerals and metals industries. The article was sent by Dr. Jerome Corsi, of Red Alert, a weekly, global financial strategies newsletter. It is 103 years since froth flotation was patented, and it is often said to be the 20th century's most important technological development. It is still the most intensively researched area of mineral processing, as is evidenced by the response that we have had to the call for papers for Flotation '09, MEI's 3rd flotation conference, which will be held in Cape Town in November. Anyone with an interest in flotation should try to be there. So far 10 major sponsors have weighed in with their support and a high-calibre international technical programme for the 4-days has now been published. The first two days will be devoted to fundamental physics and chemistry, with Prof. Cyril O'Connor, Chairman of the IMPC, and Dean of Engineering at University of Cape Town, presenting a keynote lecture: The effect of the multiple interactions between reagents and mineral particles on flotation performance – a review. The final two days will deal with applications and plant practice, with Prof. Graeme Jameson, Laureate Professor at the University of Newcastle, Australia, presenting the keynote: New directions in flotation machine design. There will also be plenty of time for networking, at the beautiful Vineyard Hotel, nestling under Table Mountain, and at the conference dinner at the Spier Wine Estate in Stellenbosch. Registration forms are now available on the conference website- and it is not too late to submit an abstract! Back row: Pete Walsh, Keith Burdon, Dave Binns, Martin Moloney, Nuru Yakubu, Musa Sheikh, Dave Dew, Danlami Garba, Pete Gilmour, Howard Askew and Ramsamujh. I would love to know the whereabouts of these students. Dave Binns I know is running a gem shop in Hastings; Martin Moloney I last saw in Australia; Nuru Yakubu I met up with in Zimbabwe about 20 years ago; Musa Sheik I met at the Indaba meeting in Cape Town about 5 years ago- he was with the Nigerian High Commission; Dave Dew was with BHP Billiton in South Africa. Next to me are Vic Phillips (deceased); Jim Turner (retired in Truro); Roger Parker (deceased); Bob Barley (retired in Camborne). Thanks to everyone who responded to my posting of 24th June regarding Nchanga metallurgists. I have had an email from Roger Kelley, who was acting concentrator plant metallurgist in late 1969. He sent me this recent photo of him and his son. Roger now lives in Santiago-Chile and is a consultant. 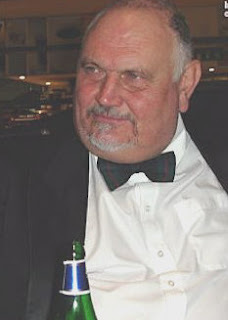 He tells me that Mick Boylett was a consulting metallurgist for Angloplat in the 80´s - he must have retired by now and probably still lives in RSA. 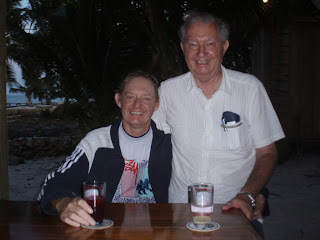 Roger also advised me of a good website for ex-Northern Rhodesians/Zambians, called the Great North Road. I was Googling a few names from the past today, and came across Paul Piercy, managing director of Silkridge Consulting in Australia. My fellow metallurgists, Vic Bryant, Tony Watts, Mick Boylett and Dave Spencer seemed a very friendly bunch and were making me welcome, when suddenly there was a hush, and a giant figure framed the doorway. This was Paul Piercy, the concentrator superintendent, who introduced himself and then asked, in a broad Australian accent “Is that your white sports car outside?”. I replied that it was, thinking how nice of him to ask, and remembering the smiling superintendent in the London film. “Well move the f****** thing, you are in my space!”. My career in the minerals industry had begun! I have to say that after that brief encounter, we did get on very well! What do we want from Society Membership? David Arthur, Head of Member Services at the Institute of Materials Minerals and Mining asks "I am keen to find out just what members and potential members ( or people put off joining for any reason) want from a society such as IOM3 ? Is it Professional recognition eg CEng, CEnv etc ? Networking ? Access to technical information ? Events ? Local groups ? What else would you like to see ? What do you value ?" Good questions. If anyone has any comments, please let me know and I will pass them on. Further to my posting of 22nd June, it has been reported that Xstrata’s proposed £40 billion merger with Anglo American has effectively collapsed after Anglo’s shareholders rejected the approach. The full story can be found in The Times Online. If anyone has any photos of the Nchanga Concentrator, which would be of help to me in writing up notes on my experiences between 1969-73, I would be very grateful. 1. The gyratory crusher at the East Mill. 2. The line of ball mills in the West Mill. Any photos used will be duly acknowledged. The Online Engineering Degree have just published their list of the top 25 mining engineering blogs. I have had some interesting emails this week from the prestigious Ian Wark Research Institute in Australia, one of the world's leading flotation research institutes. There is much competition for conferences at the moment, and Stephen Grano is of the opinion that quality conferences that have been around before the boom, such as the IMPC and MEI Conferences, will prevail. This is borne out by an email from John Ralston, who is in charge of the technical programme for next year's IMPC in Brisbane. He has already received over 600 abstracts for this event, and has a "stellar" list of keynote speakers. It looks like being an event not to be missed. MEI, being a media sponsor, will be well represented. The Wark are sending a large contingent to MEI's Flotation '09 in Cape Town in November. Flotation '07 two years ago was a major event, with exactly 100 abstracts submitted. To date we already have 90 abstracts, and this week we welcome our 6th major exhibitor, Outotec, so this year's conference is looking as if it will be at least as successful as its predecessor. What are your views on impact factor? I would really appreciate any views that blog readers may have on journal impact factor. The 2008 impact factors have just been published, and while I am pleased that Minerals Engineering is the leading mineral processing journal, I have never been a great fan of this method of rating journals. I know it is very important in academia for evaluating grant proposals etc, but it is open to misrepresentation and abuse. A very good debate on this can be found on the MEI Online Forum. The main problem is that only journals with identical subject matter can be compared by this system eg Minerals Engineering, International Journal of Mineral Processing, Minerals & Metallurgical Processing. Chemical Engineering journals tend to have higher impact factors, not because they are necessarily better journals, but because there are more researchers in the field citing the articles. I know from Minerals Engineering that papers on pyrometallurgy and gravity separation receive relatively few citations, merely due to the fact that there are relatively few researchers in these areas. Hydrometallurgy papers receive many more citations, as this area is more intensively researched (I may be a bit cynical here, but is this to some extent because hydromet research is relatively cheap- buy a few beakers and you have a hydromet lab?). This is presumably why Hydrometallurgy journal has a relatively high impact factor.